Bury St. Edmunds had one of the most important libraries in medieval England: a late 12th-century catalogue lists about 140 volumes, of which a few dozen survive today. The really exceptional feature that makes this volume stand out from most other 12th-century manuscripts--whether from Bury or elsewhere--is that it retains its original binding, almost completely intact. It allows us a rare chance to see for ourselves what such a book would have looked like to its original 12th-century readers. The two-line rubric marks the end of Book 4 and the start of Book 5. 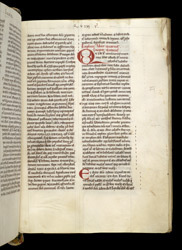 'Liber Quintus' (the fifth book) is written across the upper margins of the open pages, and sections of the text are numbered in leadpoint roman numerals in the upper and outer margins ('xxiii' and 'xxiiii'). The outer edge of the leaf also has guide-letters ('Q' and 'e') for the decorator.